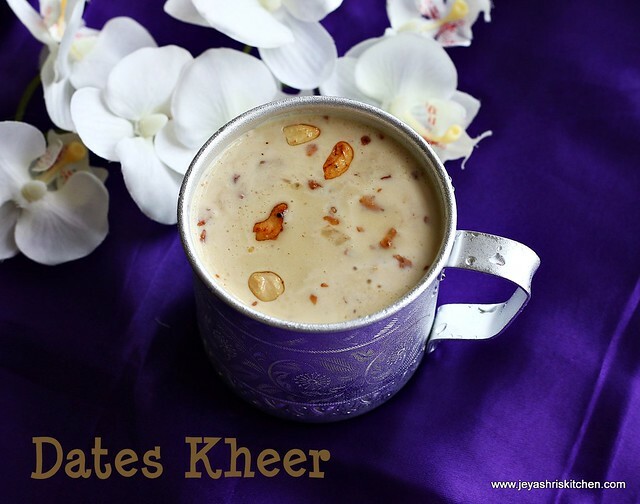 Dates Kheer| Dates Payasam is a very simple payasam. 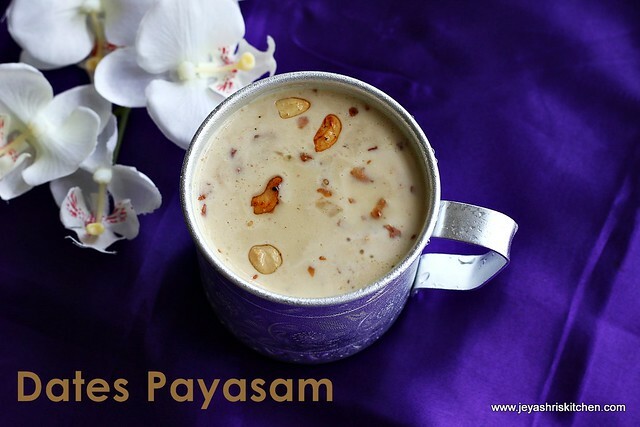 With just milk and dates this payasam can be done in a jiffy. My brother-in-law always brings big boxes of dates for us from Muscat everytime. 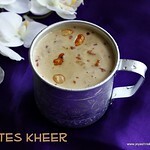 During our India trip he gave dates for us and i was too tempted to try this dates kheer. 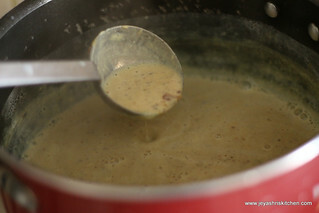 Try out this very simple dates payasam. 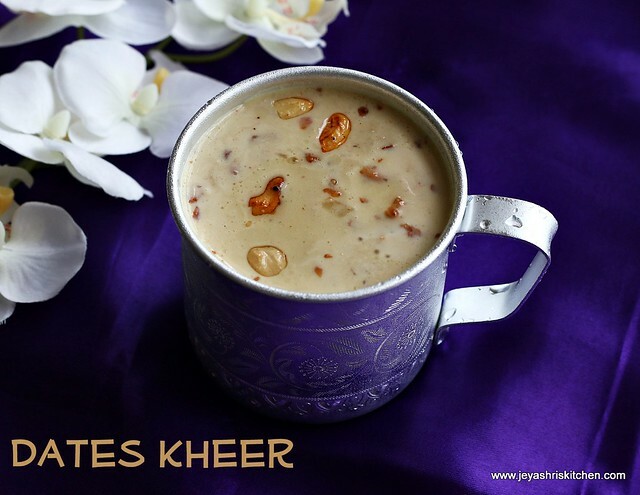 No need to add sugar to this kheer as the sweetness of the dates is enough for the payasam. Soak the dates in 1/4 cup of warm milk for 20 minutes. Boil 2 cups of milk in a pan till it reduces little less in volume. 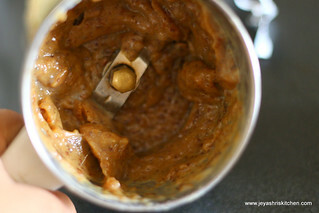 Grind the soaked dates into a smooth paste . You can add the soaked milk for grinding. Add this ground dates paste to the boiling milk. Mix well and and let this boil in low flame for 5 to 10 minutes. 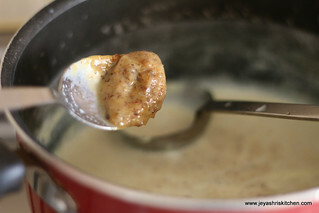 Roast the cashew nuts in ghee and add it to the payasam. Switch off the flame. No need to add sugar to the payasam as sweetness in the dates is very much enough. 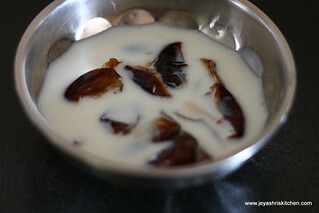 I felt the payasam was little more sweeter, may be the dates is too sweet. If you feel the dates are too sweet, either you add extra milk while boiling or lessen the quantity of dates. You can add ghee roasted finely chopped dates along with cashew nuts. Ghee roasted coconut bits can also be added. I have watched in a tv channel similar version with dry dates.my mother preapres both with fresh n dry dates payasam...even halwa also..these are also good for health as no sugar added.looks yummy. Thanks jeyashree. I am not that fast in cutting veggies. It takes a lot of time for me, and was looking for a food processor online. But nothing seems much interesting. And ur name has become my household name as I keep trying almost every other recipes from ur blog. Awesome work you are doing. Keep it up. Can I use coconut milk instead?